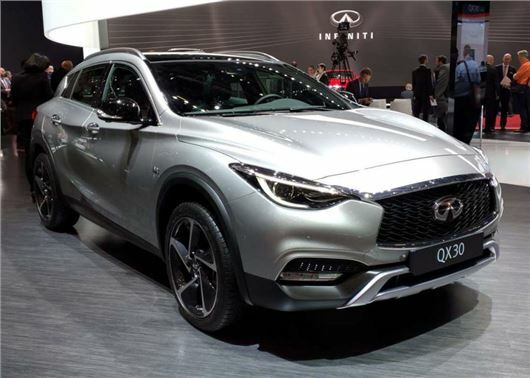 Infiniti has launched its new QX30 crossover at the Geneva Motor Show. The Audi Q3 rival will go on sale in the summer from £29,490 and feature all-wheel drive as standard. Built in Sunderland, the QX30 stands 45mm higher than the Q30 hatch with which it shares most of its parts and interior. Unusually for a crossover, the QX30 gets all-wheel drive as standard (there’s no front-wheel drive version) and a seven-speed dual-clutch automatic transmission. Infiniti hasn’t officially said which of the Q30’s engines the QX30 will get, but we’d expect the bread-and-butter version to be powered by the 2.2-litre diesel with 170PS. In the Q30, it gets the car to 62mph from zero in 8.5 seconds, so expect to add half a second to that. There are no details on trims or equipment levels either, but Infiniti tell us the QX30 will be better equipped like-for-like than the Germans however, in order to give it a USP beyond styling that Infiniti itself calls "turbulent, sculpted character."